Humidor signed by Lennox Lewis and Randolph Churchill (Winston's great grandson). 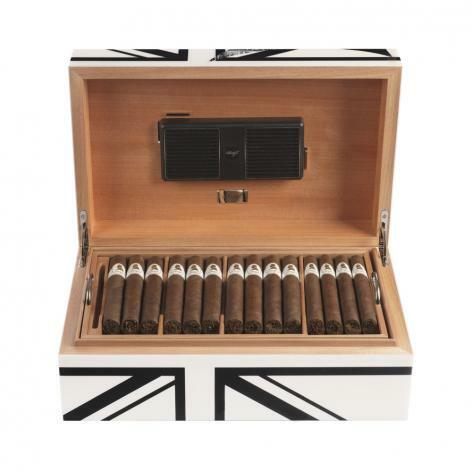 The humidor features a strong design statements inspired by Sir Winston Churchill's many facets. Storage capacity of 70 to 90 cigars. The highest online bid will become the starting bid at this year's Viña Carmen Cigar Smoker of the Year Dinner on the 3rd of December at Boisdale Canary Wharf in London. If there are no higher bids at this auction, the online bidder will win the lot. The highest online bidder will receive a ticket to the Cigar Smoker of the Year Dinner. This Lot will not be subject to any buyer's premium.